Here’s what the Football Manager 2018 data has to say about the likely line-ups for this match. Yesterday I waited until the teams were announced and it all felt a bit rushed, so today I’ve done the analysis up front using my best guesses of likely starting 11s. The explanation for this is here but in a nutshell I’ve treated the Football Manager database like a scouting tool and compared the two teams across a range of measures by combining their in-game attributes. 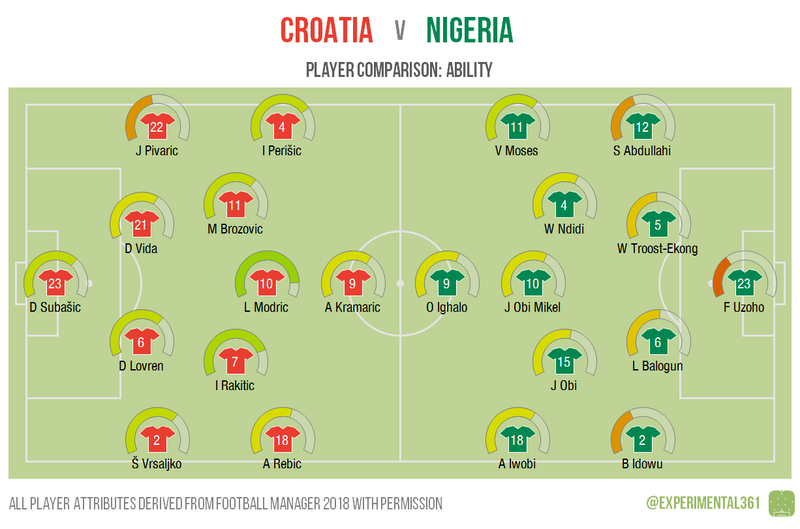 Croatia appear to be the favourites on paper, with the centre of their midfield looking particularly strong. Nigeria’s defence looks particularly vulnerable, with the goalkeeper and full backs poorly-rated in the game. Modric and Rakitic have the ability to run the show here, and will almost certainly be given the ball at every opportunity. 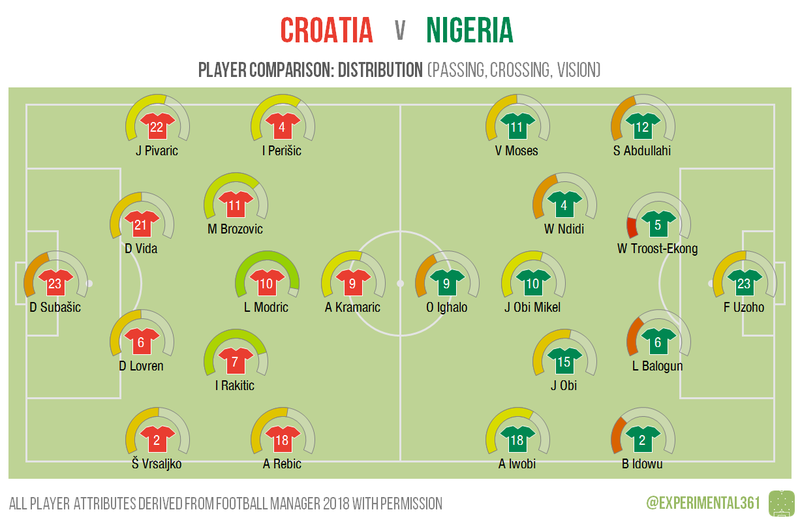 For Nigeria I’d expect the defence to be playing simple passes to the players ahead of them rather than trying to fashion chances themselves, with Alex Iwobi and Jon Obi Mikel the likeliest players to create something. Both sides look pretty mobile overall, although Mikel may well leave a lot of the running to the player around him. 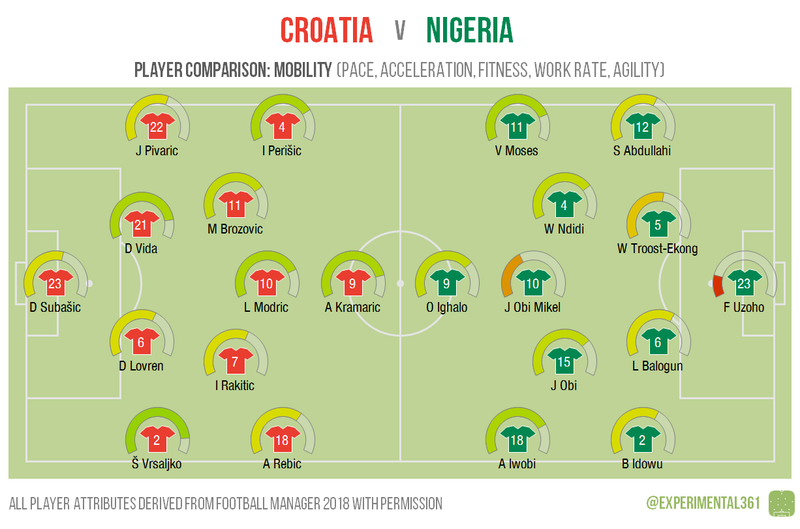 The Nigerian wide midfielders in particular look capable of bursting into space, although Croatia are likely to have at least one manoeuvrable player on each flank. 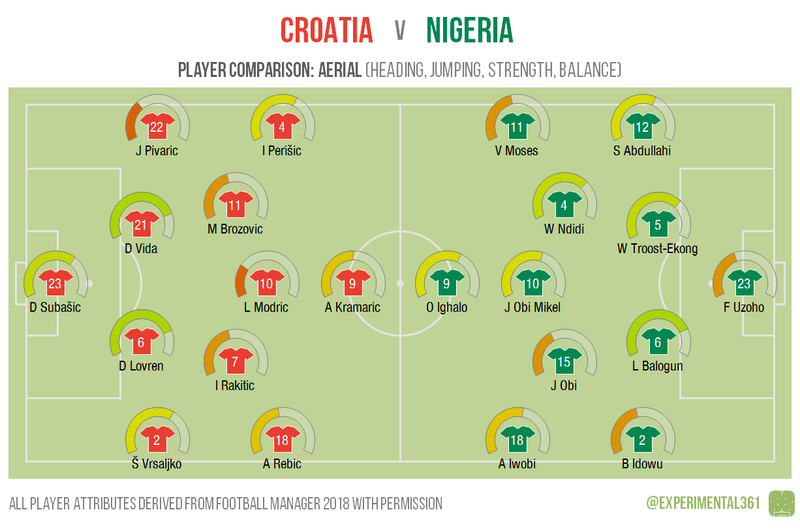 Apart from the two central defenders, there’s not a lot of aerial presence in the Croatia side – although if Mario Mandzukic plays then this would be less of an issue. While Nigeria aren’t collectively all that towering themselves, they look to have an edge worth exploiting here.